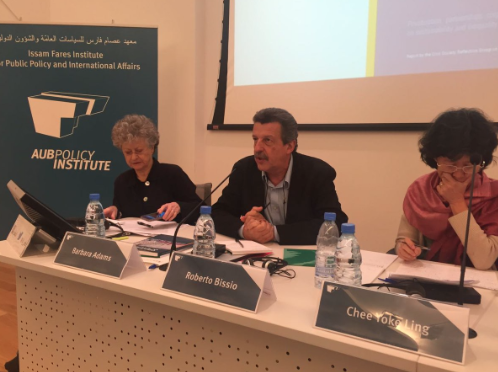 From November 30th - December 1st, CESR's Director of Human Rights in Sustainable Development Kate Donald attended an international workshop in Beirut, Lebanon organized by the Arab NGO Network for Development (ANND) and the Issam Fares Institute. The workshop, "Strengthening Public Policies for the 2030 Agenda," aimed to provide a space for exchange of experiences and strategies among representatives of national, regional and global civil society initiatives. Kate presented in a session about inequalities within and among countries, arguing that the groundbreaking inclusion of inequality in the SDGs is being undermined by the dominant policy and financing approaches. As an example of this 'business-as-usual' approach, she highlighted fiscal policy, in particular austerity measures, regressive taxation and unfettered tax evasion and avoidance. Changing the record requires concerted global cooperation, with those countries with most effective power – especially those that preside over tax havens – having the biggest responsibility, "especially as these same countries often trumpet their commitment to ‘overseas development’, while allowing vast quantities of money to be siphoned off from poorer countries". Kate highlighted "similar hypocrisy from big multinational corporations who are jumping on the SDG bandwagon, but also doing everything they can to avoid paying their fair share of tax – including profit shifting, using tax havens, and lobbying for tax breaks/loopholes/incentives." The current status quo of extreme concentration of wealth combined with corporate capture creates a "vicious cycle of political and economic power, whereby economic power grants political access and influence, which is then used to influence tax policy in favor of economic elites, thereby further exacerbating economic inequality". This is why we need a politically savvy human rights approach: "Tax is not just a technical issues, but rather an issue of power and resources... a human rights approach must mean transforming power relations". Kate also moderated a session focusing on monitoring the SDGs, experiences from the High-Level Political Forum and Voluntary National Review process, and the SDG indicators. The workshop was followed by a public event which officially launched the 2017 Spotlight Report in the Arab region. On December 2nd Kate then attended a meeting of the "Reflection Group on the 2030 Agenda for Sustainable Development", whose members (including CESR) publish the annual Spotlight Report.